Quite a few years ago. a friendly American Foundation sent some 500 to 800 teenage students to Budapest, Hungary every summer for 10 years, as part of the Student Ambassador Programme. The students were hand-picked from all the 50 States and they came in groups of 25 to 30. Every group was accompanied by 4 to 5 teachers, also hand-picked from all the States from Alaska to Florida. The program included London, Rome and Budapest and the main aim was to stay here for a week, learn as much as humanly possible about the local, and through that about the European Culture, and then go home and disseminate what you have learned in your school, in your town, or in a wider community. The programme was extremely popular both with the Guests, and with the Hosts, in the Budapest leg the students, the teachers, and the non-teaching staff of the International Language School Group. We were doing a massive Russian Teacher Re-Training Programme at the time, and the re- trainees had a unique chance of meeting decent native speakers of English in a one-week live-in arrangement. The Guests were living with the families of the students, the trainees, their teachers, and the whole staff. As part of the programme, we took them round in Budapest to see the sights and learn about the history, the geography, and many other aspects of the culture of the place, all wrapped up in tales and anecdotes, and myths to make it more memorable for the Guests, and more interesting for their then future listeners back home. We did the same at more places in Hungary in coach trips and boat trips to old kings’ seats and places of famous battles. We even had quiz-shows: about Hungary and Europe for the Guests, about the USA, Canada, and the Americas for the Hungarians, and about general knowledge for mixed groups. It was great fun and I cannot tell how much we all laughed. As the director of the International Language School Group, I met all the students and all the teachers. and I had many of the teachers as visitors in my classes. They were very interested in how we teach English to our students to make them so confident communicators in a foreign language. They tried to relate our techniques and methods to their own, and they also had many good questions. I guess both parties learned a great deal from the exchange, and it is most definitely true for me. There was one buzz-word that came up from practically all American teachers, and I could not make head or tail of it. It was the Bloom’s Taxonomy, and, most sincerely, I had never heard of it. As a teacher and teacher trainer, I was quite well at home in TESOL, i. e. Teaching English for Speakers of Other Languages, and I was quite sure that the Bloom’s Taxonomy had not entered the realm of language teaching. I knew nothing about it, but the frequency with which the American teachers mentioned it made it felt like a panacea, the solution to all the educational world’s problems. The more I heard about it, the more interested I grew. It was very clear from the outset that it was not worked out for language teaching, what is more, with language teaching in mind among all other subjects. I had a very strong feeling that the teacher and the teaching are sort of left out if the Taxonomy starts with Knowledge. 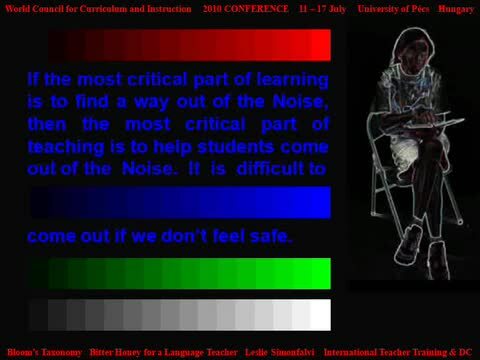 It was not a general criticism since I knew quite well that there are opposite requirements in learning anything in L1, i. e. the mother tongue, and learning L2, i. e. a second- or foreign language, through anything. In the first case, you ’know’ the medium of communication, and you learn new information, fact and figures, concepts and relationships through that medium. In the second case, you have some ’knowledge’ of the world around you, and through that knowledge you learn a new medium for communication, i. e. for the communication of old knowledge through the new medium, but also some new knowledge through the new medium. it handles the developmental steps in the affective and psychomotor domains as distinct from the cognitive. I had a strong feeling that the Bloom’s Taxonomy, if we manage to complement it according to the missing links above, might give us a new insight into what we are doing, to be able to do it better and develop further. It might also give us a chance to extend our teaching to groups of students we were not able to teach, or else were not able to teach well enough before, i. e.
and mild cases of mentally handicapped students. It is also very important to apply all our new insights in the teacher training and development. Because of this I started to analyse our teaching and teacher training in relation to, among others, the Bloom’s Taxonomy. 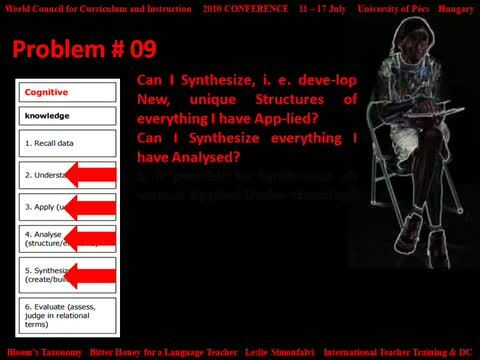 Over the years, I have found 14 Problems, i. e. points that are most definitely problem-spots in language teaching, but may or may not be problems in the teaching of other subjects. The solutions to these 14 Problems add up to 14 Theses and the material related to this fills a DVD. It is enough for a 200-hour series of workshops, or three semesters in teacher training. It has been tried in Hungary, Italy, Belgium, Wales, and the Netherlands, and also in the Africa Project in Islington, London, UK. It has always worked where teachers and trainers really wanted to change and were ready to apply a new paradigm.